Epic: Cinematic Drums & Sound Design is a virtual instrument created for use with Native Instruments Kontakt 5 engine. Truly epic in scope (over 10.3GB uncompressed) but also simple to use, Epic is ideal for composers and sound designers working in film, movie trailers, games, television, production music, web design, or advertising. Epic not only includes a huge variety of cinematic drum loops and sampled drums - it's also a powerful and flexible tool for cinematic-style sound design. Create your own rhythmic fills and patterns with Epic's multi-sampled instruments. 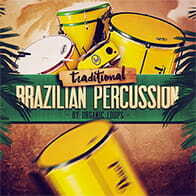 Includes 58 multi-sampled drums and percussion instruments, 24 Performance Kits (total of 1711 loops and one-shots), and 388 high-quality cinematic sound effects. 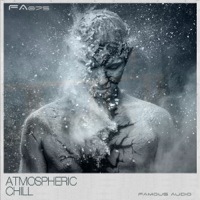 - 388 high quality cinematic sound effects. The Following End User License Agreement is included with Epic: Cinematic Drums & Sound Design. This License is only valid for the individual who has purchased an unopened, new and lawfully made copy of Epic: Cinematic Drums & Sound Design from a dealer or distributor authorized by Big Fish Audio. "The samples contained herein are licensed, not sold to you, the individual end user, by Funk/Soul Productions.This non-exclusive, non-transferable license is granted only to the individual end user who has purchased an unopened, new and lawfully made copy of this product from a dealer or distributor authorized by Funk/Soul Productions. All samples remain the property of Funk/Soul Productions and are licensed only for use in the creation of a live or recorded performance that includes the licensed samples as part of a derivative musical work created by the licensed end user. This license expressly forbids resale, rental, loan, gift or transfer of these samples in any format or via any medium, except as part of a derivative musical work. PLEASE NOTE: The samples may not be included, whether unmodified or as part of a derivative work, in any sample library product. Any unlicensed usage will be prosecuted to the maximum extent possible under the law." 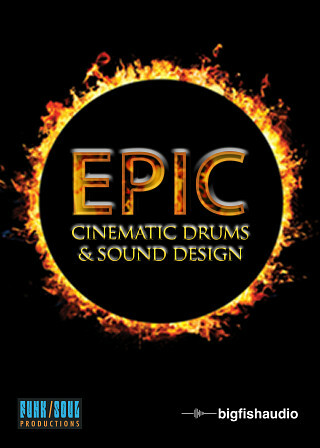 Hi, Steve Sechi here, producer of EPIC: Cinematic Drums & Sound Design. As those of you who've been to the BFA site before might have guessed, EPIC is related to the best-selling Epic Drums sample CD series. I think it's safe to say that if you liked the Epic Drums series, you're *really* going to like EPIC. The difference is that EPIC: Cinematic Drums & Sound Design is not a sample CD - it's a Kontakt virtual instrument. Like the Epic Drums series, EPIC features hundreds of killer performance loops, organized into 24 different Kontakt construction kits. But EPIC also includes multi-sampled versions of all of the drums we used in the performance loops, so you can easily create your own customized fills, rhythms, and sounds, or mix and match pre-generated loops with your own custom material. 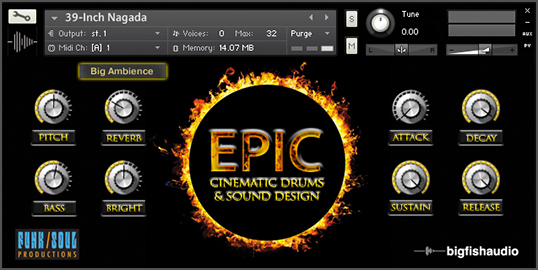 EPIC features a huge variety of ethnic drums and percussion, including Chinese drums, taikos, African drums, frame drums, small and large gongs, cymbals, quints, a complete set of five Roto-Toms, and a massive, studio-shaking 39" nagada drum from India. We also included hundreds of high-quality cinematic sound design elements, like thundering Hits, Impacts, Metals, Risers and Whooshes. Every construction kit features a selection of loops, one-shots, and cinematic elements, making it fast and easy to compose Action, Suspense, or Horror cues when you're on a tight deadline. Another time-saving feature: we mapped all loops according to their pitch, from low to high on the keyboard. EPIC's Graphic User Interface is also a time-saver. It's pretty much plug-and-play - easy to use right out of the box, with the most important controls located on the front panel of the GUI. And of course, those who like to tweak their sounds and loops can find the full compliment of Kontakt effects under the hood just by clicking on the "tool" icon.